There isn't really a bigger advocate in the land for Butlin's than me. Having holidayed there as a child, worked there as a young adult, and had my hen night there as a "responsible" adult, it's a home away from home for me and I am a bit too excited about the fact that I'm going back with my son, neice and nephew soon. 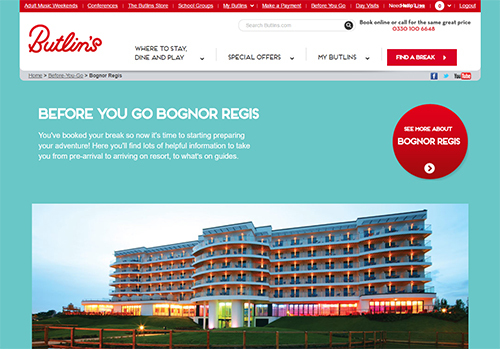 So when I mention a few little snags that I've found with Butlins.com whilst planning my long anticipated trip, I mention them with love, just so that they can potentially be looked at by the team behind a very large, complicated and great looking site. To be honest, I booked a while ago and can't really remember much about it. 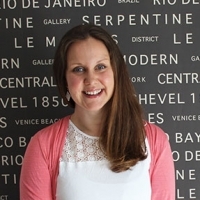 Other than we wished we could see prices more clearly when selecting our accommodation type. But we appreciated that there were reasons - from memory, to do with extras and dining plans - as to why this wasn't shown upfront. I also ended up ringing the call centre because something was less than clear when I was entering my details - something around entering MY details as the main booker when asked for other guest details. But I was rushing at that point. But the main little snag I noticed during the booking process was with the very lovely charity donation option at the checkout. 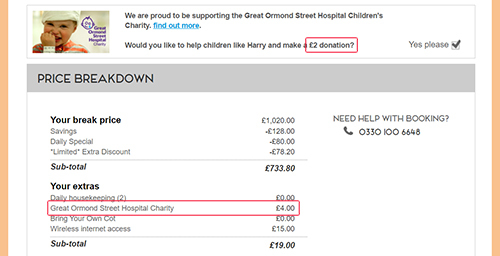 It's quite small in the image below - but I ticked a box to give a £2 donation to Great Ormond Street Hospital - and it added £4 to my total. Like I say, this was a while ago and it may have been fixed already or I may have caught a brief little bug but it stood out at the time and I wondered if perhaps it was basing it on the fact that I was booking 2 lots of accommodation? But now it's getting a little bit 11th Hour so I thought I should look into it. So I returned to my confirmation email and clicked the red "My Account" button. Unfortunately it didn't work - and neither did the "My Butlin's Account" link. 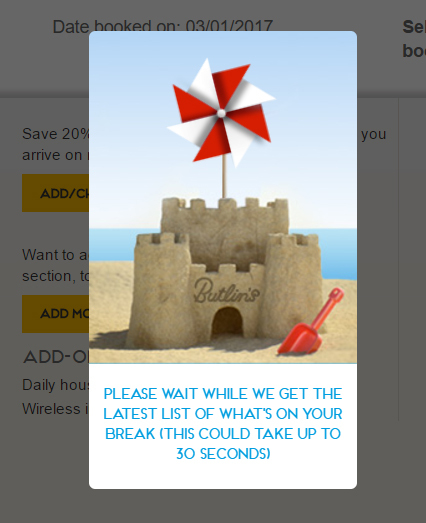 This URL took me to a screen simply saying "Sorry, I don't understand that request, Please Click <a href=http://www.butlins.com>here</a> to return to the homepage.". A nice polite message, but with a grammatical typo, a non-functioning A HREF tag and just generally not My Account. But not to worry, I went to the website to see if I could log in there. This was all fine - although perhaps a tiny bit of UX work could be done. 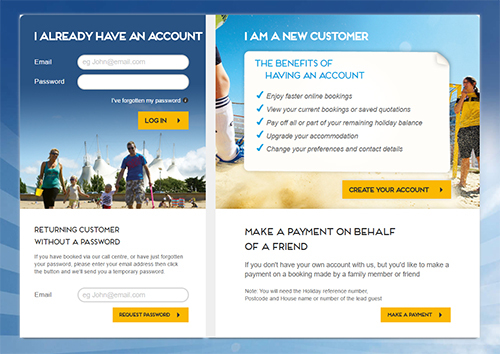 A very pretty page asks you to login, or if you're a returning customer who doesn't have a password because you booked over the phone (Moi) to enter your email address inorder to be sent a temporary password. The slight tiny UX thing here is that on entering your email address and hitting "Request Password", you're taken to the top of the page... so the message that tells you "Woop! You have successfully requested a password! Check your email for your new temporary password. You can change it any time in your My Butlin's area." is 'below the fold'. I hate that expression - the 'fold' is different for everyone, but generally I do like error messages, or informative messages, to appear at the top of the page even if they're then repeated in situ lower down. As it is, the page refreshes and you wonder if anything worked... or like me you scroll down thinking the message might be further down and you find it there. The next little observation is that I wasn't actually sent a temporary password - I was sent a reset password link so I could set my own. Which I actually preferred, because I stand a chance of remembering it now. But it might be worth updating the text on the site to that effect. I know how all too easy it is on a big site to make a change and then miss one tiny little place that references the previous way of working! OK, I exaggerate - and I can be pretty jumpy when people sneak up on my so it wasn't the biggest fright ever - but it is the reason I'm actually writing this blog post! But that is hopefully a relatively quick fix to save some other moments of panic! Oh, and whilst I'm talking about the dashboard / account area - I love the use of language ("x more sleeps" etc.) and the design is lovely... but it does often fail to load properly and the little windmill loading graphic - whilst possibly the prettiest loading graphic I've ever seen - is quite stubborn at going away. When I opened something in a new tab, I think the current page got the windmill and it wouldn't leave. I've also just spotted, whilst going back to make these screenshots, the "EMAIL TO A FRIEND" option on the pre-arrival info... but unfortunately it loads a 404 in a light box. It's a great idea though, as I did email my sister in law a link to the PDF earlier. Anywho, that's pretty much all I found - hopefully there are a few easy wins there to just make the user journey a tad more seamless, on a super large, complex, beautifully designed, probably-constantly-changing (they're the hardest to manage!) website.